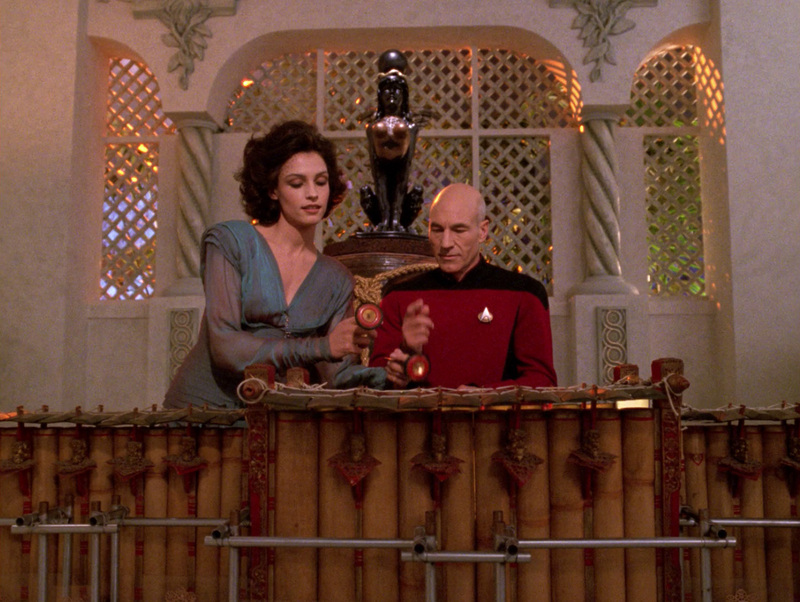 Ex Astris Scientia - Observations in TNG: "The Perfect Mate"
Here are some observations about sets, props and visual effects in TNG: "The Perfect Mate" without a specific theme, and a comparison of the original TV release (TNG) with the remastered episode (TNG-R). 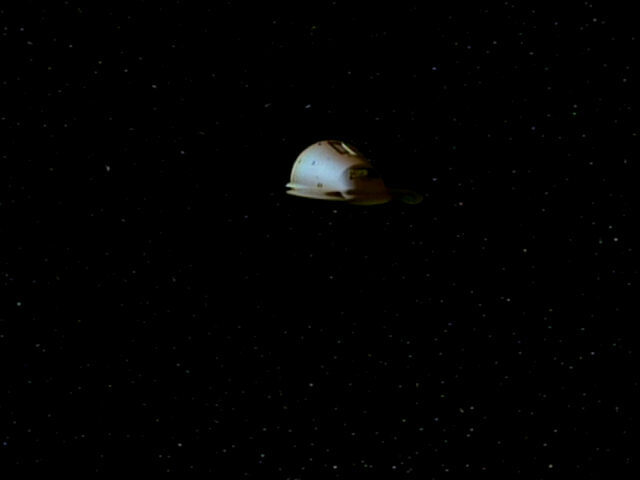 The footage of Krios was originally created for "Lonely Among Us" where the planet appeared as the Selay homeworld. 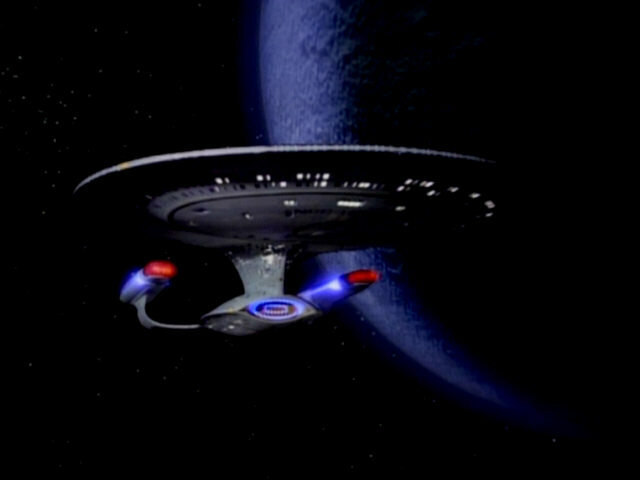 After several re-uses in episodes such as "Too Short a Season" and "Manhunt", the planet appears for the last time in this episode. 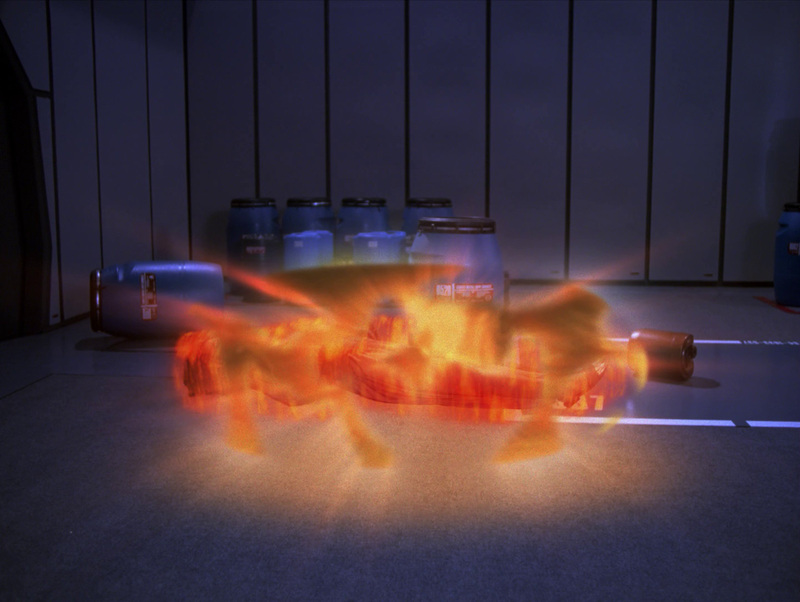 Another Krios appeared in the season 4 episode "The Mind's Eye". 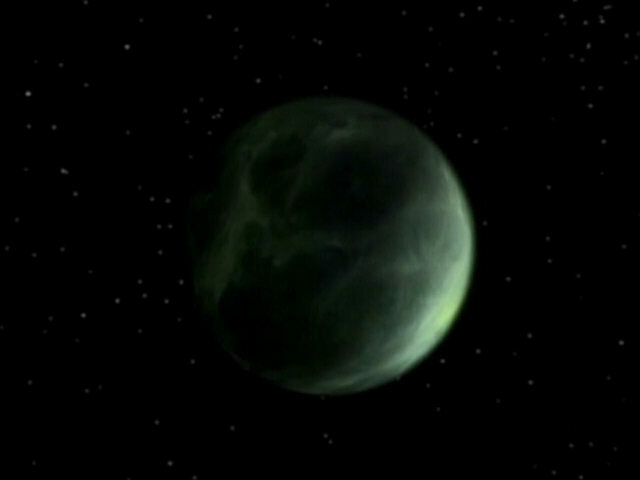 They cannot be the same system, as that planet was blue while this one is green. 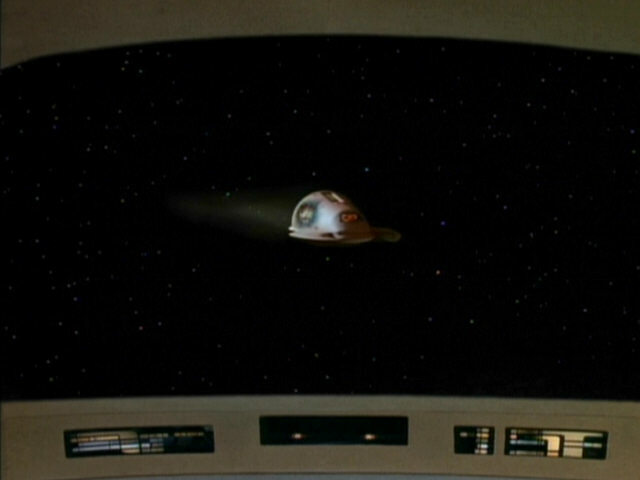 "The Mind's Eye" The producers replaced Krios with a new green planet, creating consistency with the original episode, rather than with the planet of the same name from "The Mind's Eye". 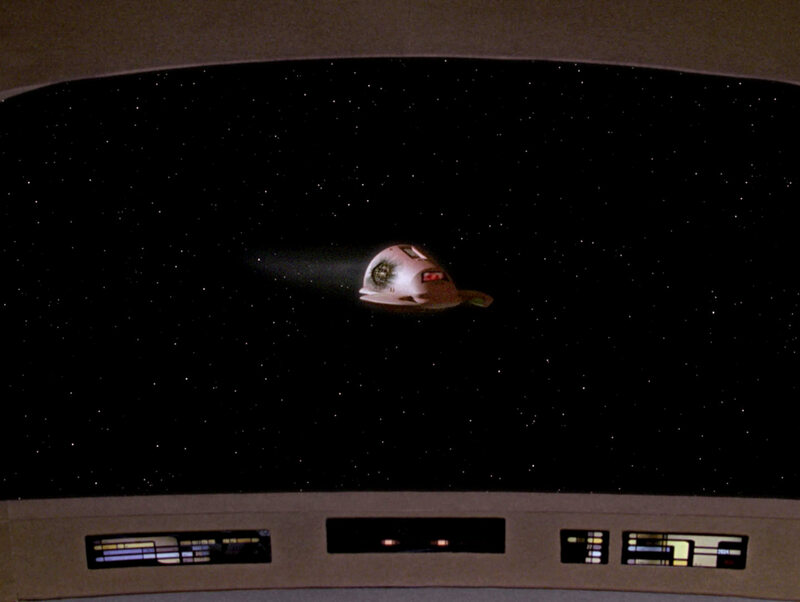 The footage of the Ferengi pod was originally created for "The Price". 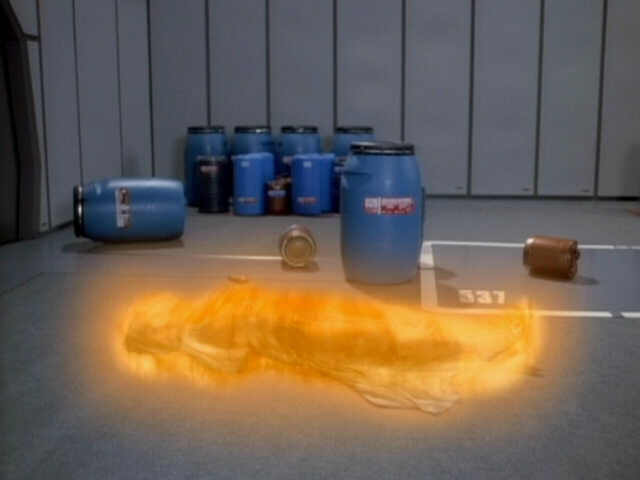 The leak and the explosion were added in post production especially for this episode. 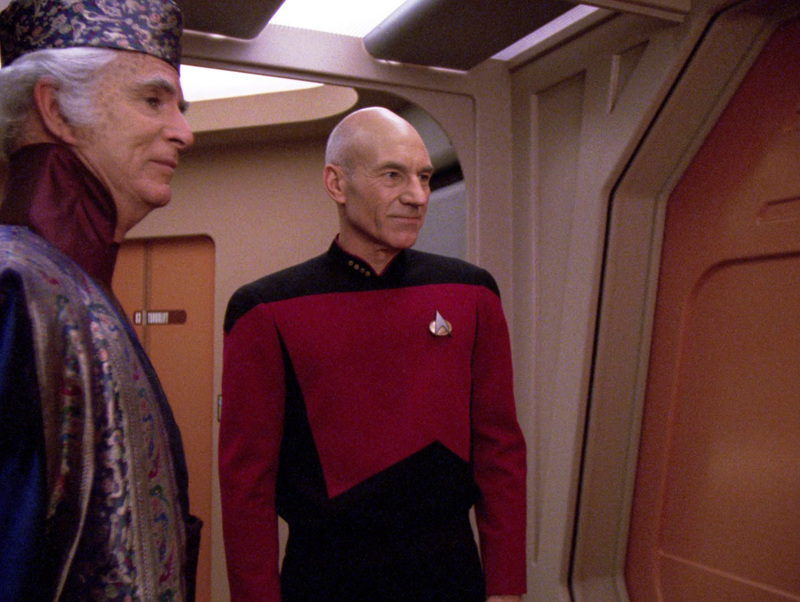 "The Price" The effect of the damage was reconstructed for TNG-R.
For this episode, the junior officers' quarters was cut in half, turning the large set into two separate sets. 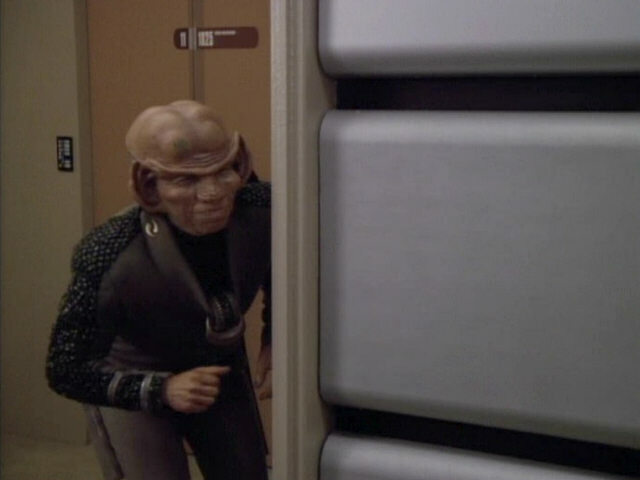 The guest quarters of the Ferengi are seen in these two screenshots. 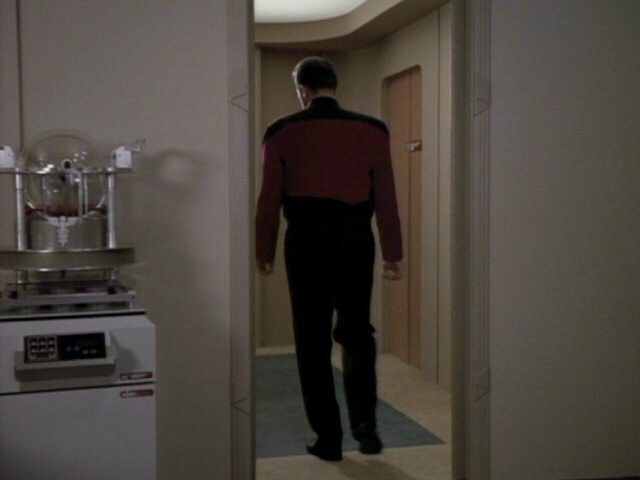 Their quarters consist of the "front" half of the junior officers' quarters. 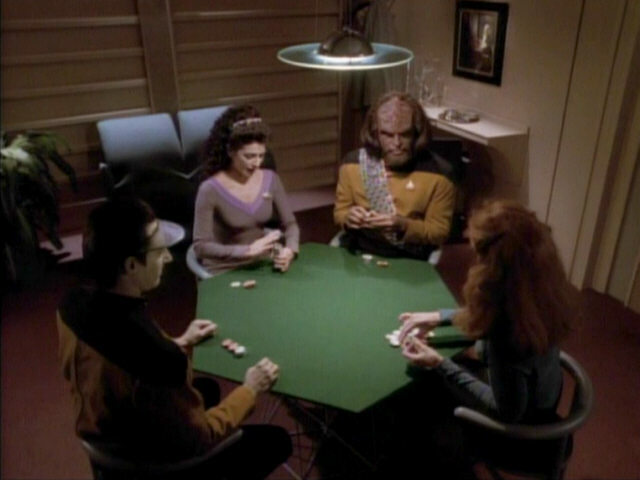 This is the general area in which the poker games in Data's quarters are held, for example, as can be seen in the screenshot from "The Outcast". 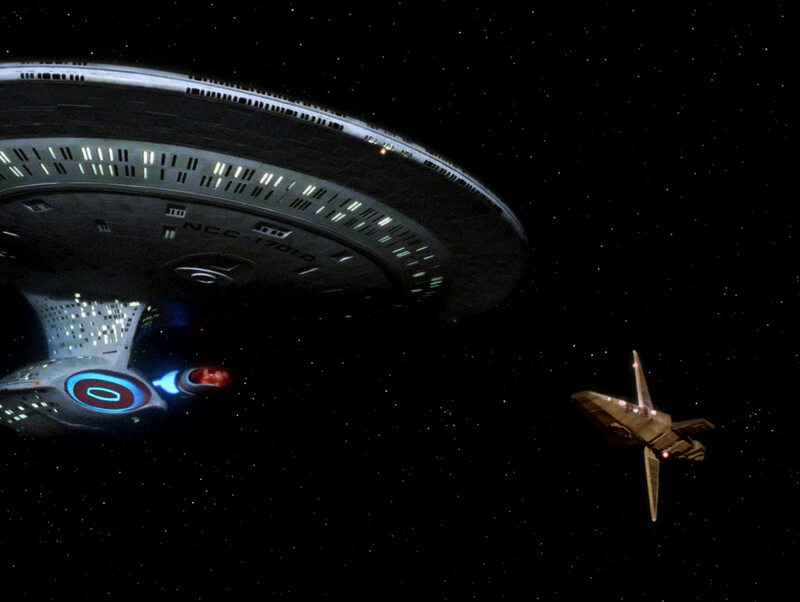 A flyby of the USS Enterprise-D. 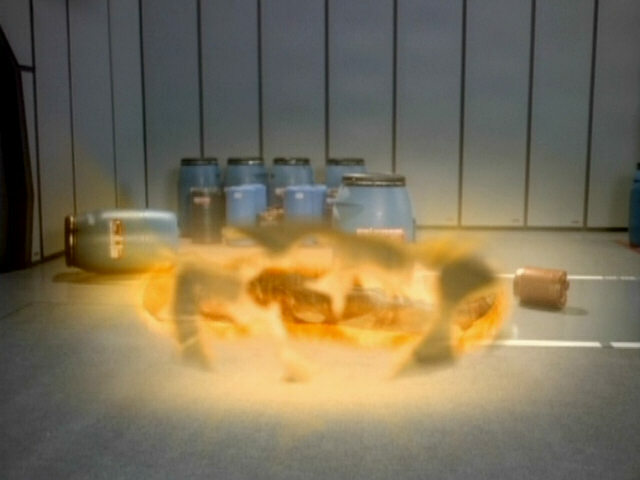 The same footage appears several times in the episode. Enterprise Flybys in TNG and TNG-R Like in many episodes before, the shots had to be recreated using CGI. 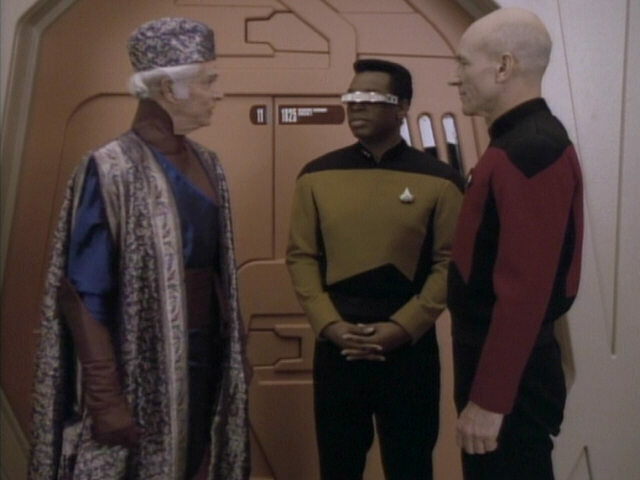 As Picard, La Forge and Briam are seen approaching the holodeck, the footage was still filmed in the large corridor set. 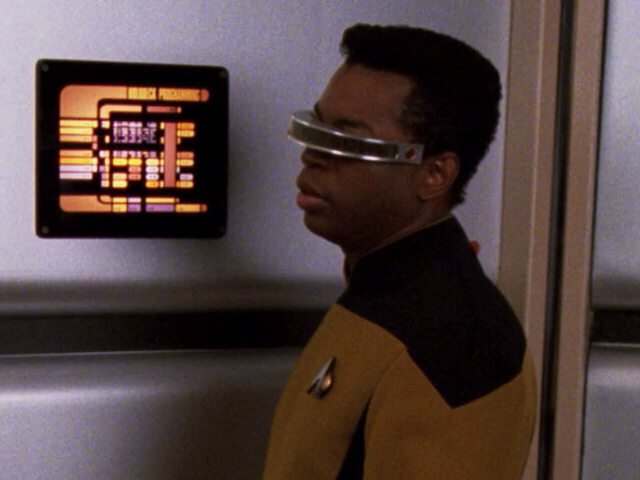 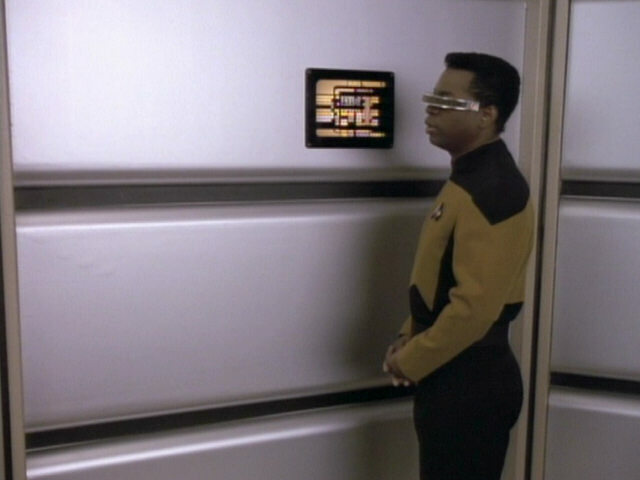 When the shot switches to La Forge accessing the holodeck controls, the actors are filmed on a separate short corridor with a holodeck door and access terminal and not the regular area of the corridor set, as can be seen when comparing the wall to the right of the holodeck control with the regular appearance of the corridor set. 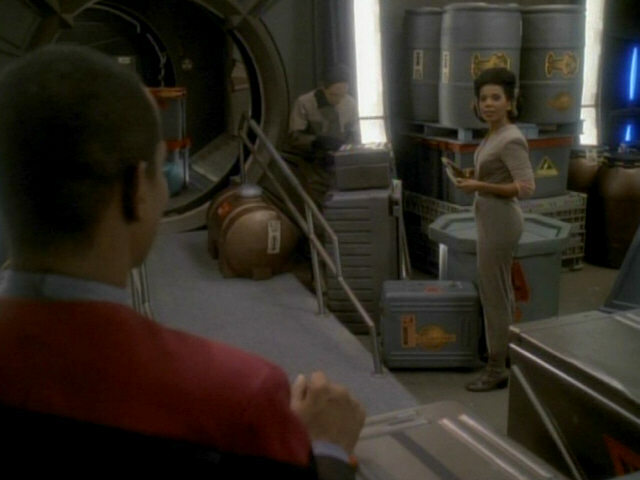 The Temple of Akadar set was not built behind the regular large double doors as the cargo bay/shuttlebay set, normally located behind those doors, was needed a little later in the episode. 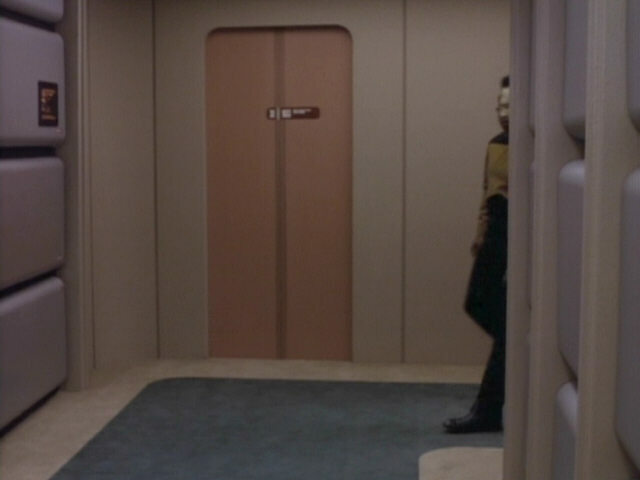 The short "fake" corridor is similar in appearance to how the holodeck entry appeared in the first two seasons before it was connected to the large corridor set. 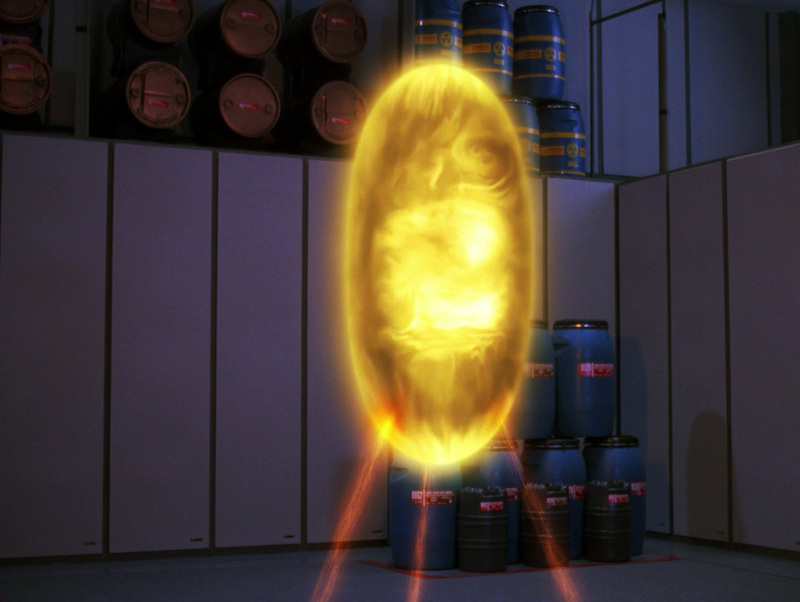 "The Emissary" The holodeck entrance in HD. 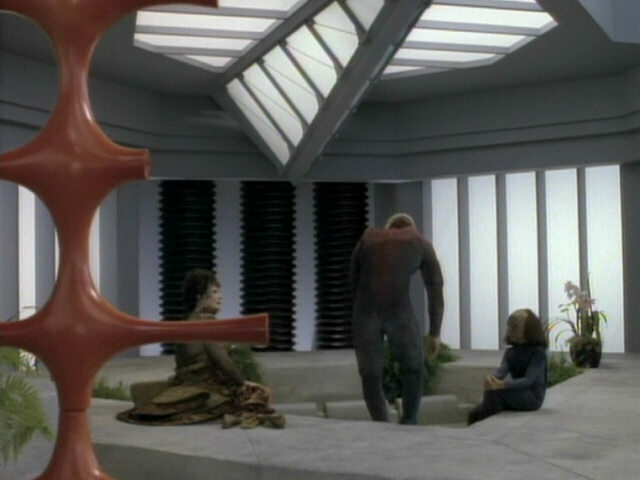 Parts of the Temple of Akadar set are re-uses of the Parallax Colony set from the previous episode "Cost of Living". 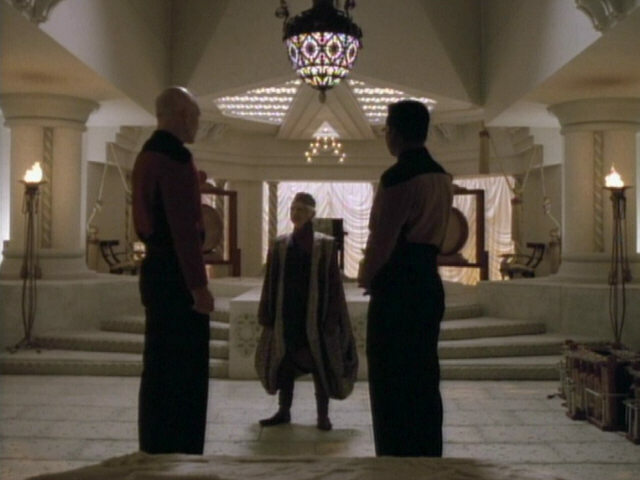 The area where the throne is located in this episode uses the same set pieces as the mud bath area in the Parallax Colony, as is evidences by the ceiling lights and illuminated side walls. 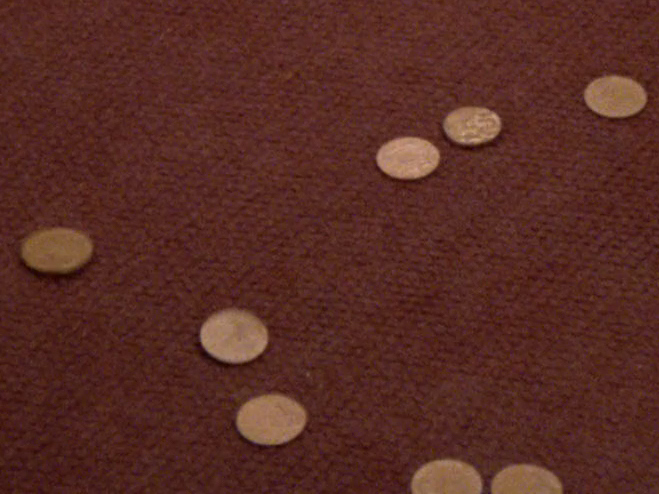 "Cost of Living" The set in HD. 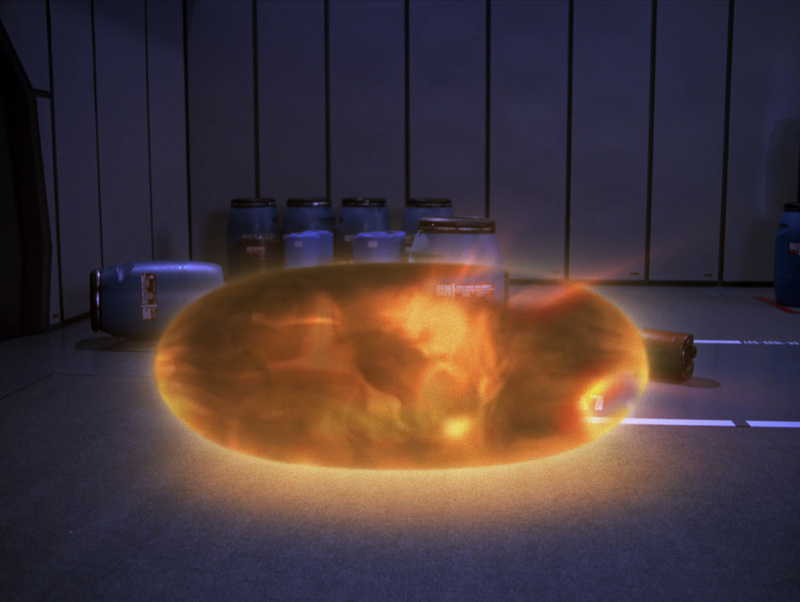 The Kriosian cocoon was created in post production using CG effects. 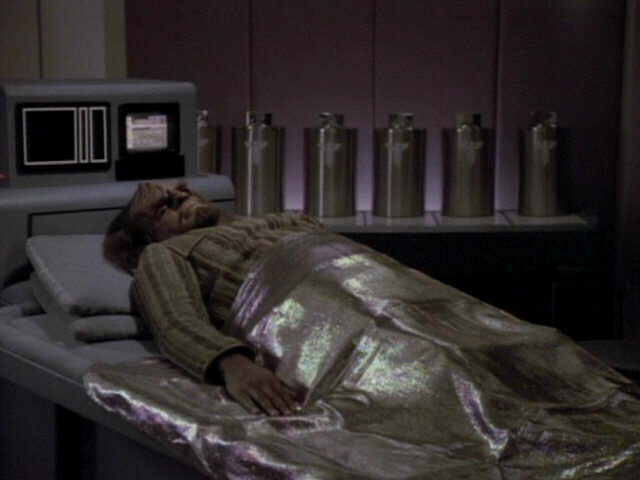 The cocoon in HD. 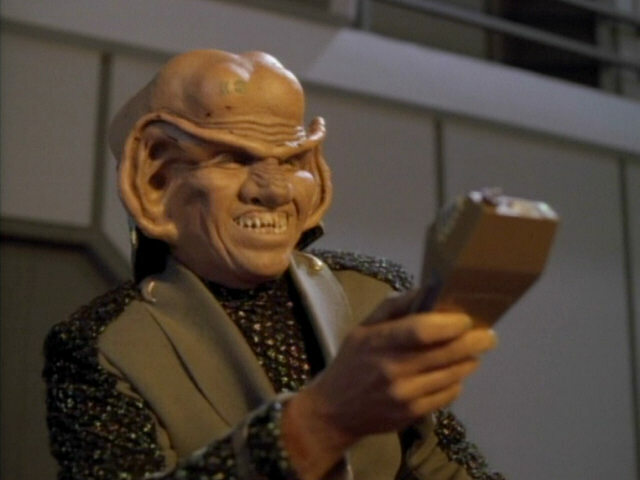 This is the first time a Ferengi tricorder is seen on the show. 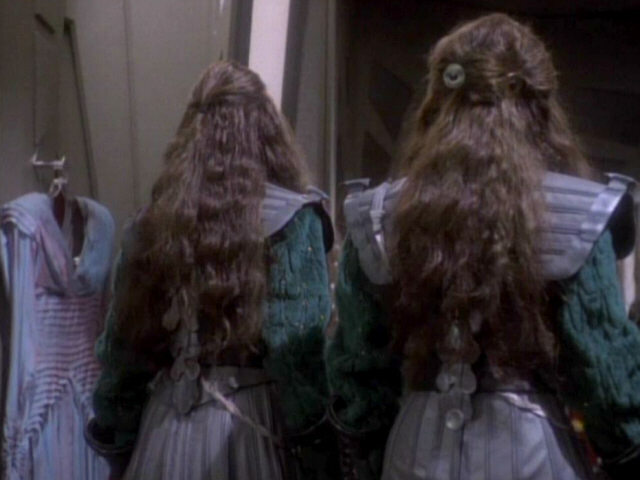 In "Firstborn", the front half of the rarely seen prop can be seen much better. 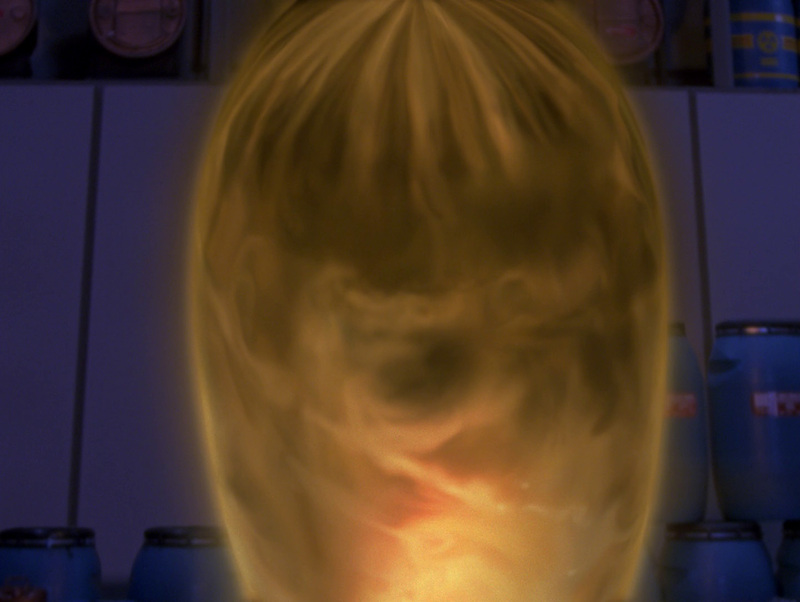 "Firstborn" A better look at the device in HD. 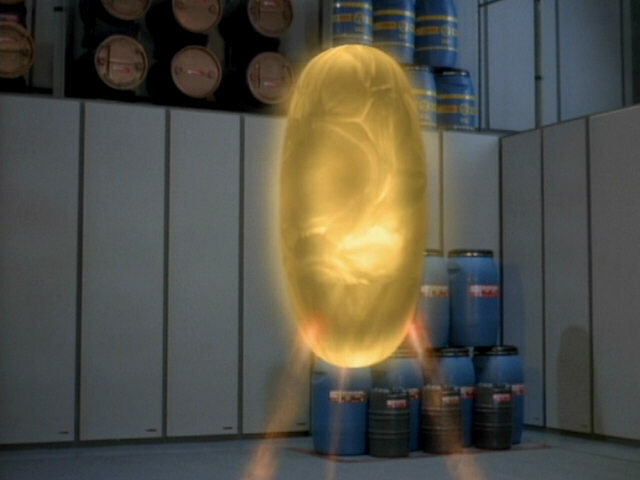 The Kriosian cocoon gently glides to the ground and slowly dissolves, releasing the empathic metamorph Kamala. 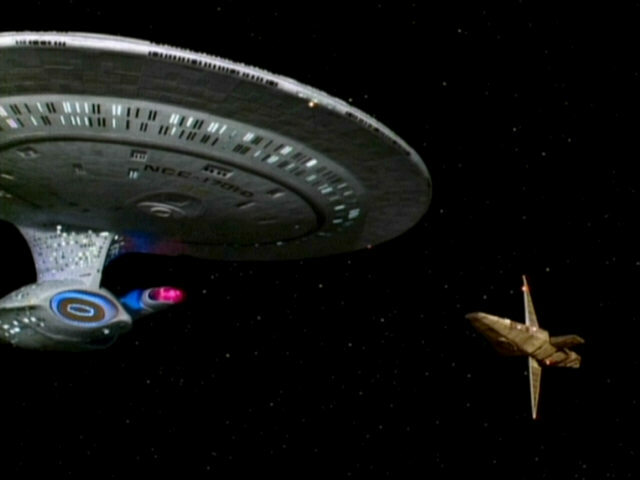 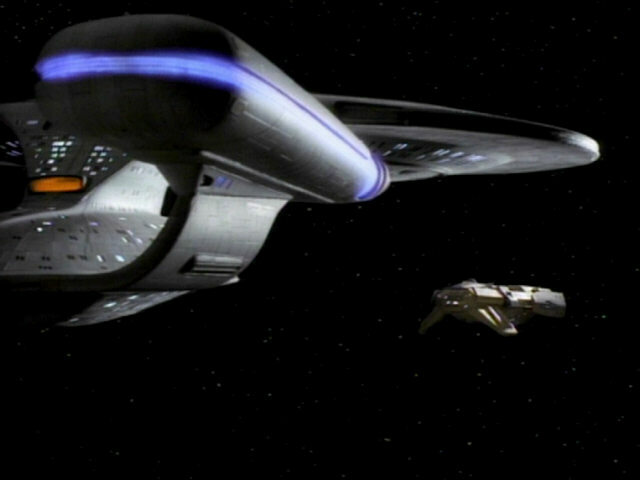 The effect as it was reconstructed for TNG-R. 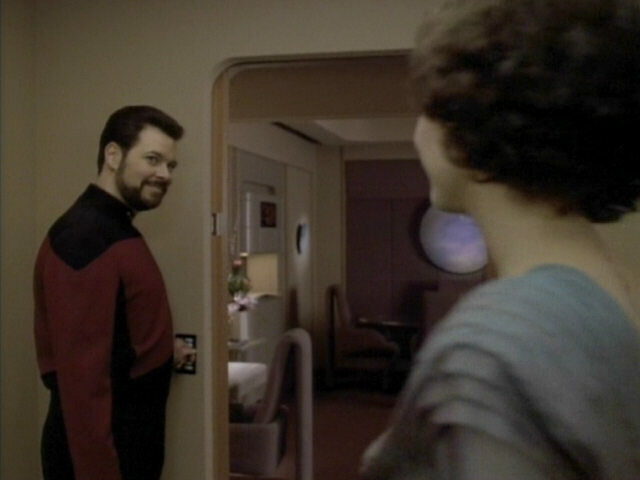 Here, Riker and Kamala are seen entering the other half of the junior officers' quarters set. 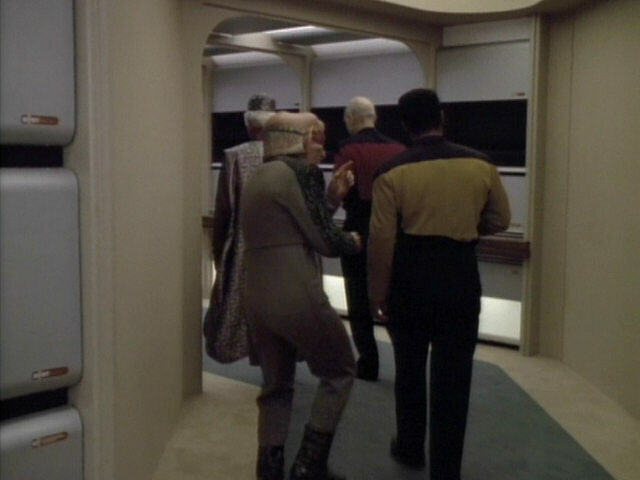 This is the first time we see someone enter the set from the corridor side. 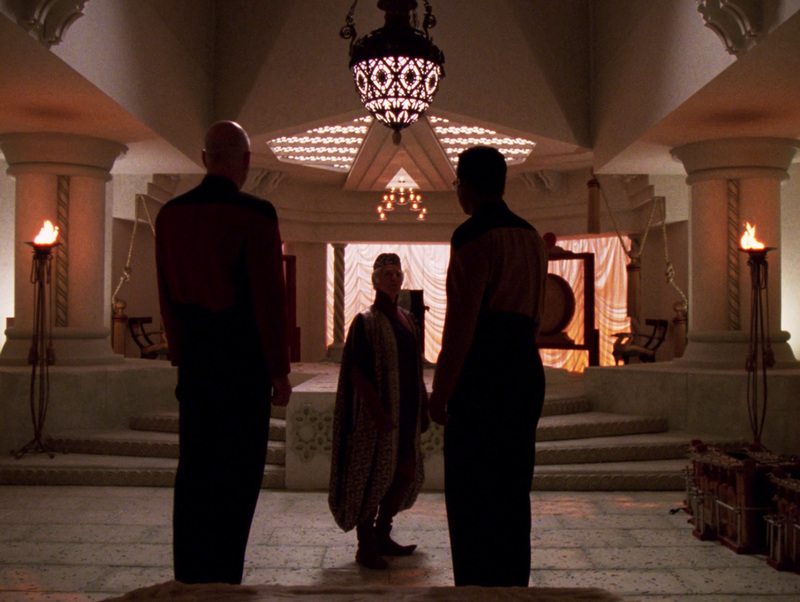 In "Ethics", this half of the set was used as Worf's sickbay room. 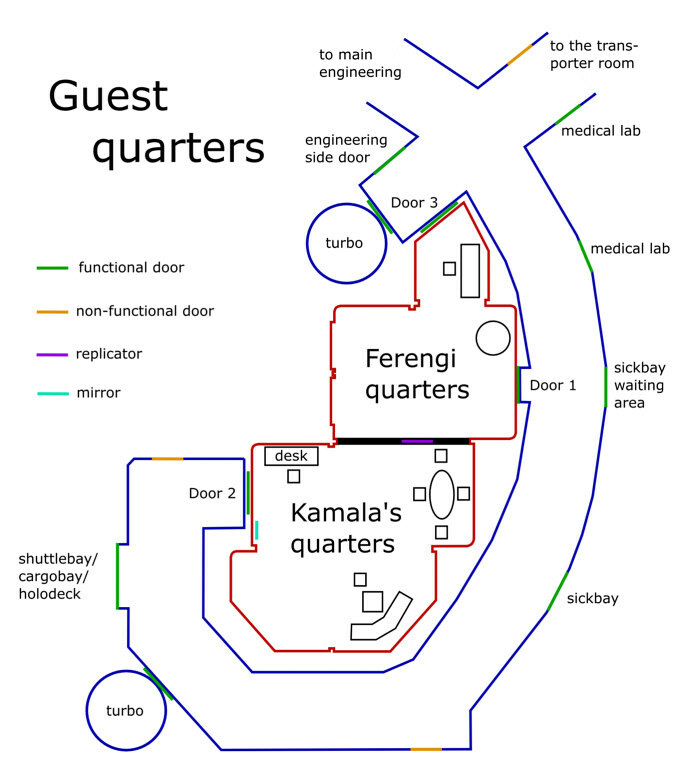 In that episode, people were only seen entering the room from the interior of the set. 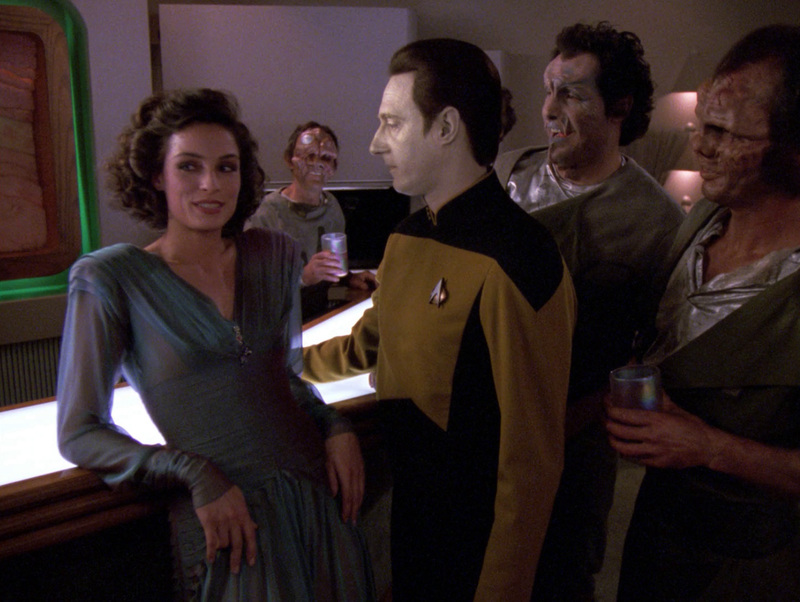 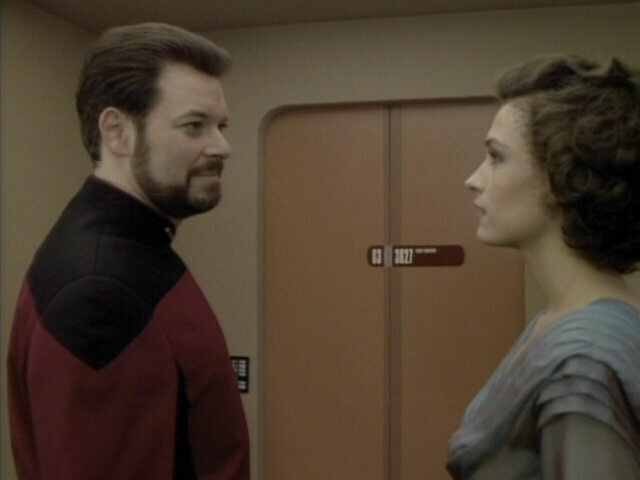 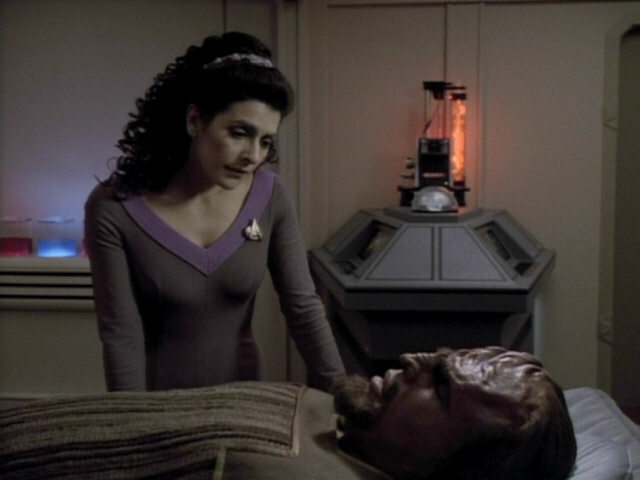 The script of the episode required Riker to show Kamala how to use the replicator. 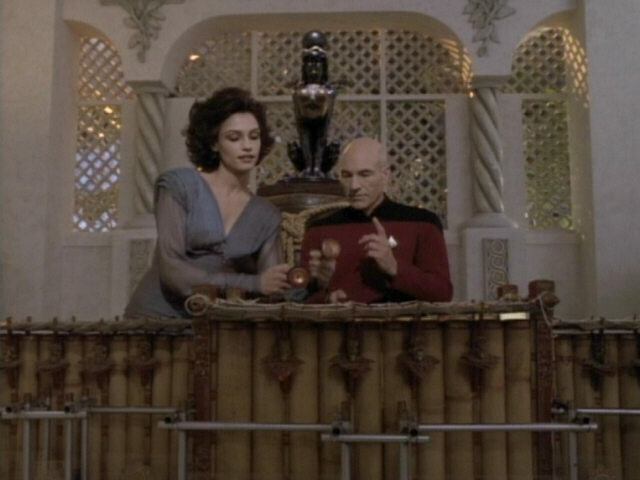 Later in the episode, Kamala orders two cups of Earl Grey tea from the device. 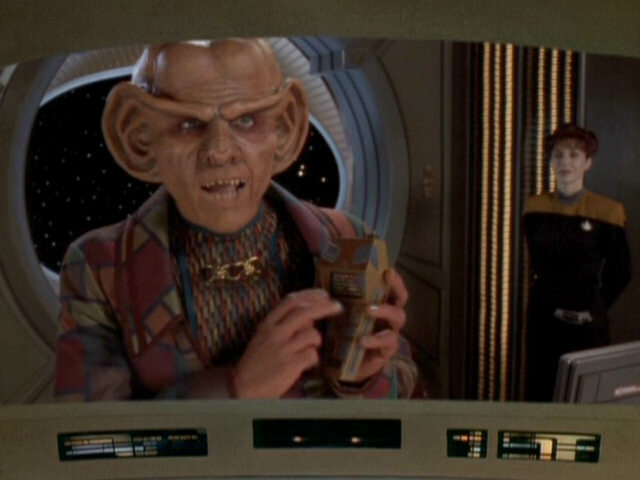 As the small replicator in the junior officers' quarters is located in the other half of the set (where the Ferengi are residing in this episode), the large replicator from the senior officers' quarters needed to be incorporated into this half of the set. 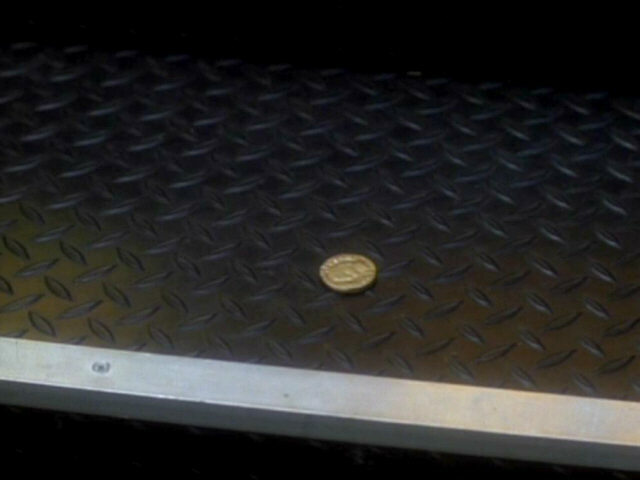 In "Ethics", a door was located here. 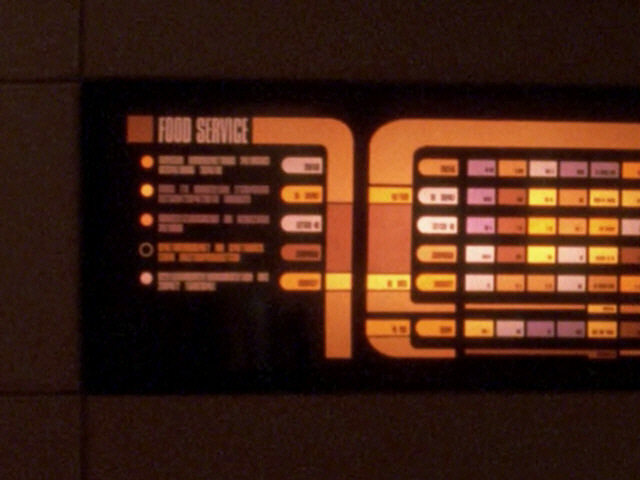 "Ethics" An HD close-up of the replicator menu. 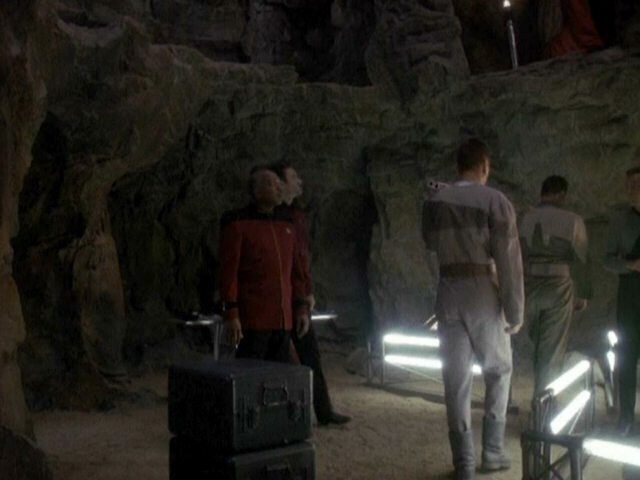 Although the alien miners seen in this episode are all said to have been picked up at Harod IV, they are clearly members of three different alien species, all never seen before. 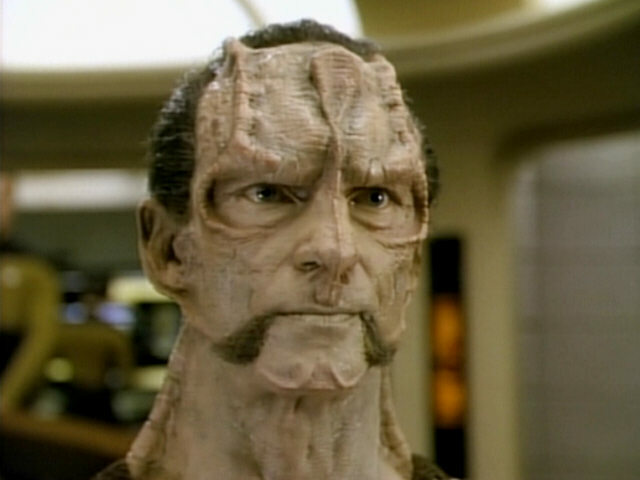 The cranial ridges of the alien with the yellow skin are very similar to Cardassian facial ridges as seen in "The Wounded" and "Ensign Ro". 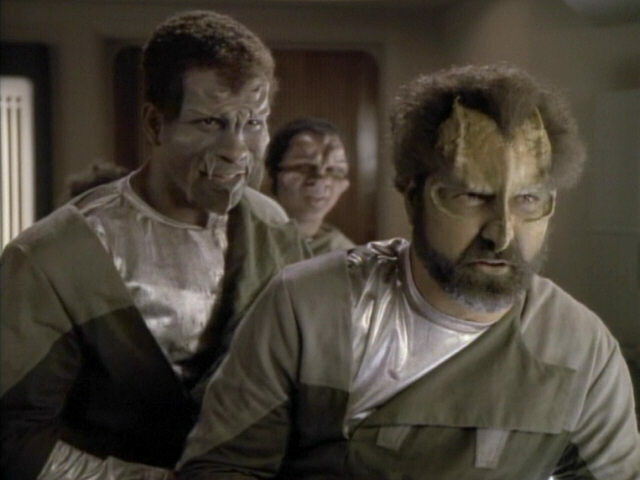 The alien species of the miners seen in the background of the first screenshot and on the right of the second screenshot shows some similarities to the Benkarans seen in the Voyager episode "Repentance". 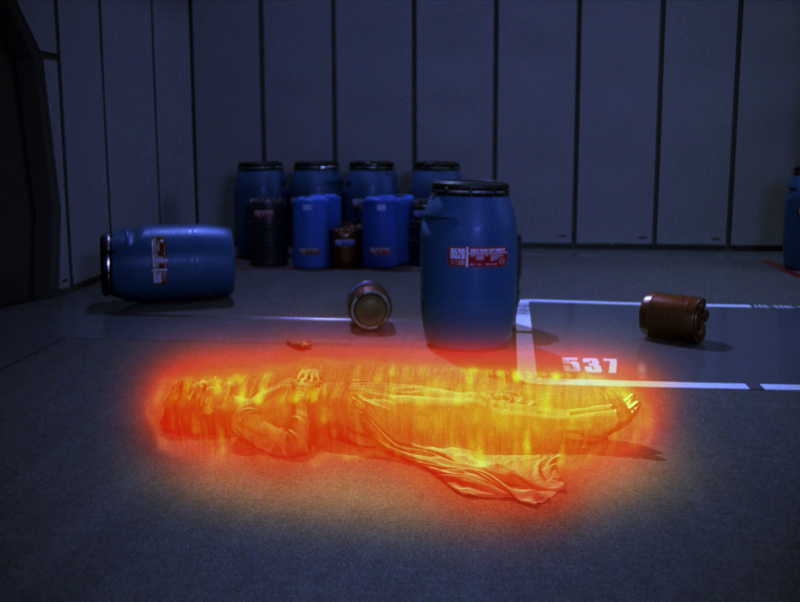 "Repentance" The aliens in HD. 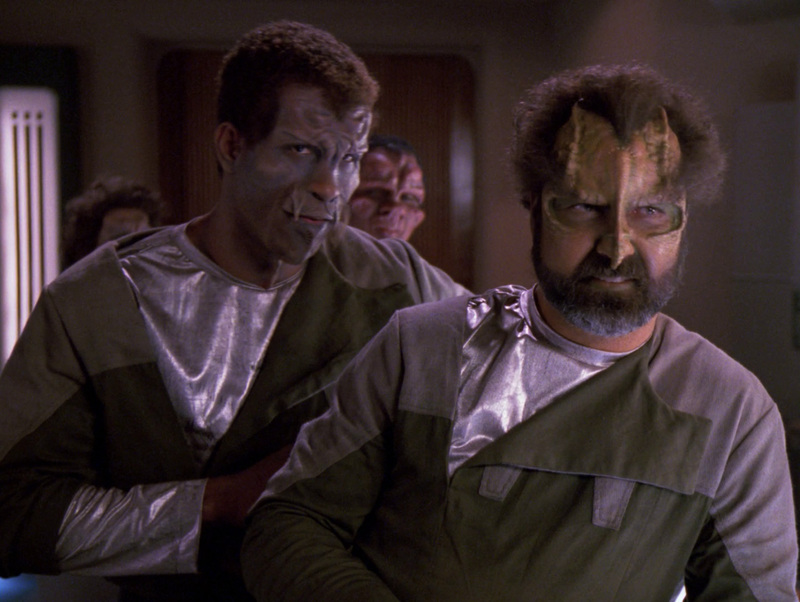 The costumes worn by the miners later showed up in a couple of Deep Space 9 episodes. 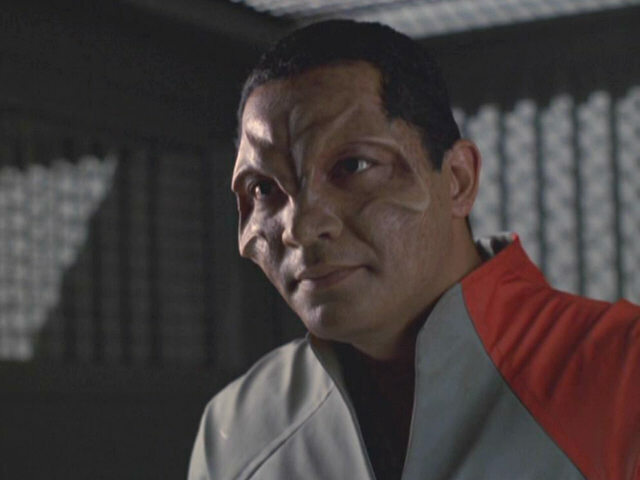 One costume was worn by a crewmember of Kasidy Yates's ship, the Xhosa, in "Family Business" while another could be seen on a Bajoran archaeologist in "Rapture". 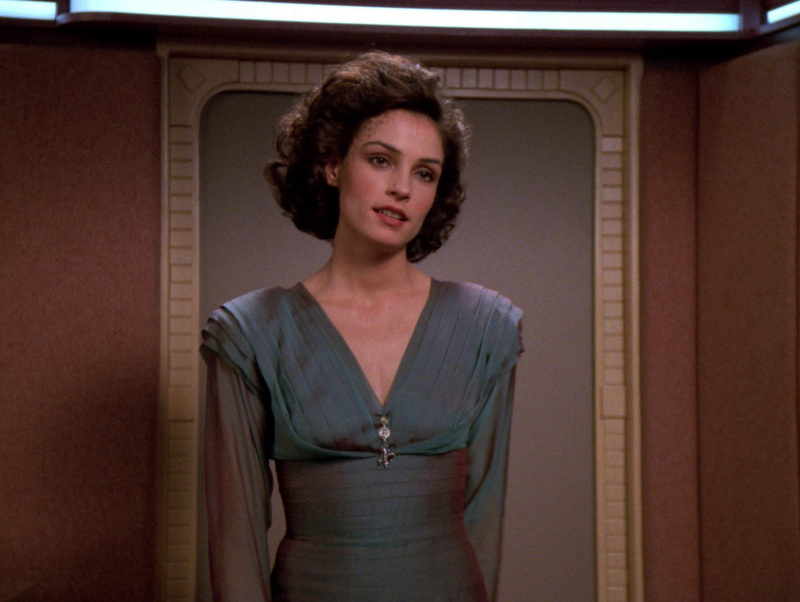 Kamala's dress also showed up in a later DS9 episode. 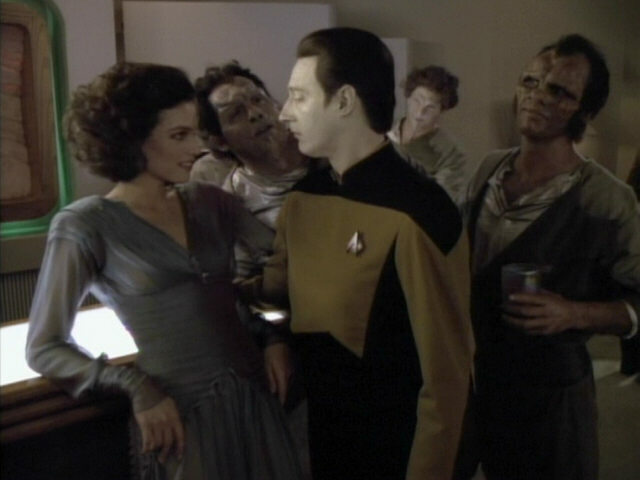 It was seen in Garak's tailor's shop in "Past Prologue". 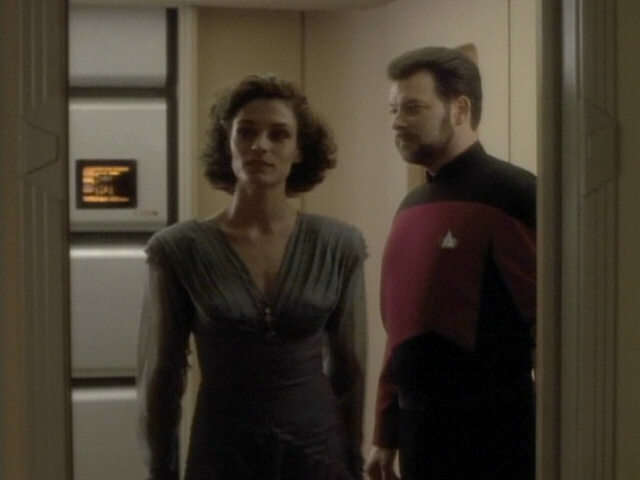 "Past Prologue" The dress is really attractive only in HD. 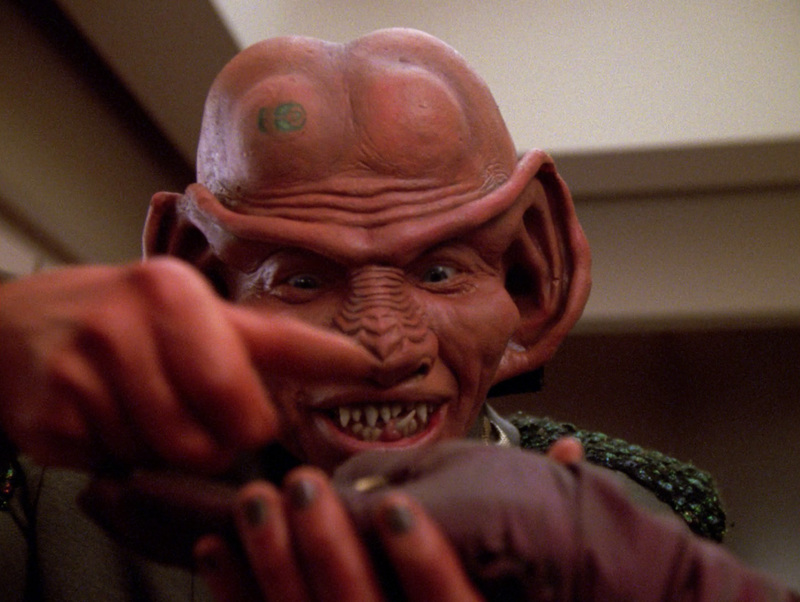 The Ferengi try to bribe Briam with Ludugial gold, "the purest in the galaxy". 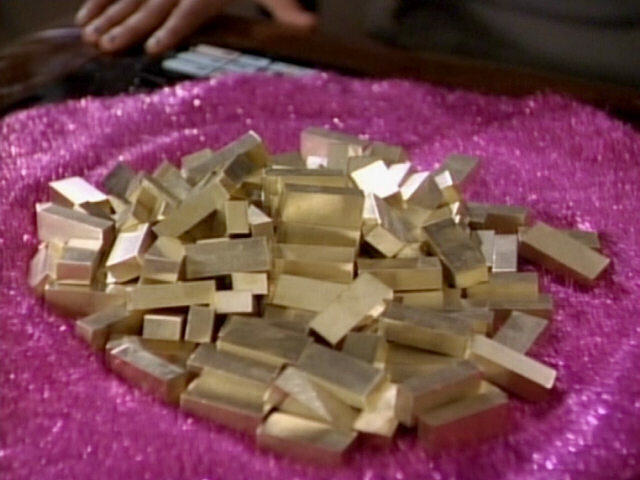 At this time in the series, gold-pressed latinum had not been introduced yet as the regular Ferengi currency, so "normal" gold is used in some early episode. 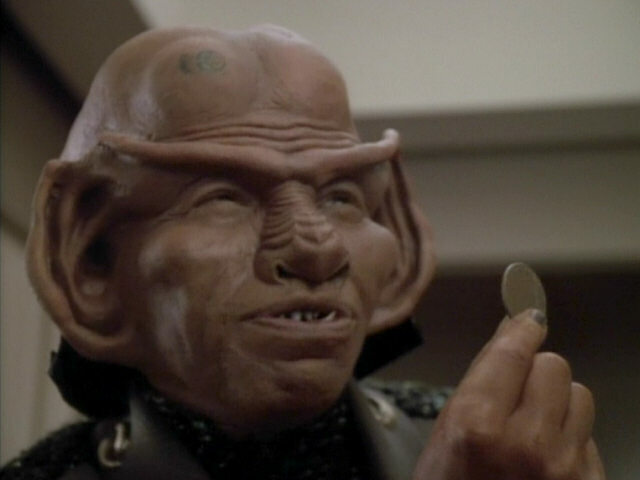 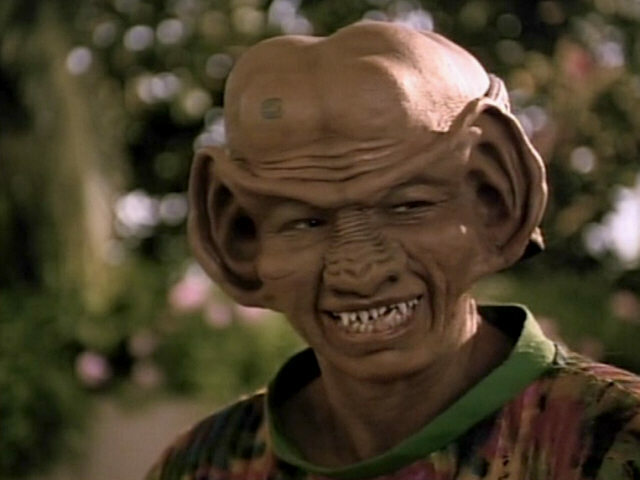 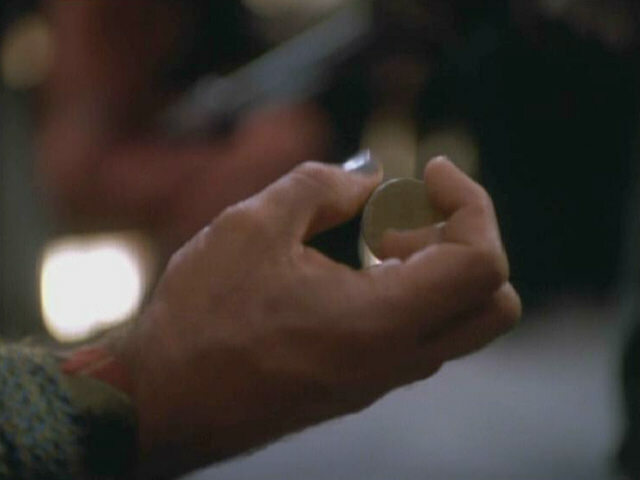 In "The Price", the Ferengi used small gold bars as a method of payment while Ferengi coins also appeared in "The Nagus" and "Invasive Procedures". 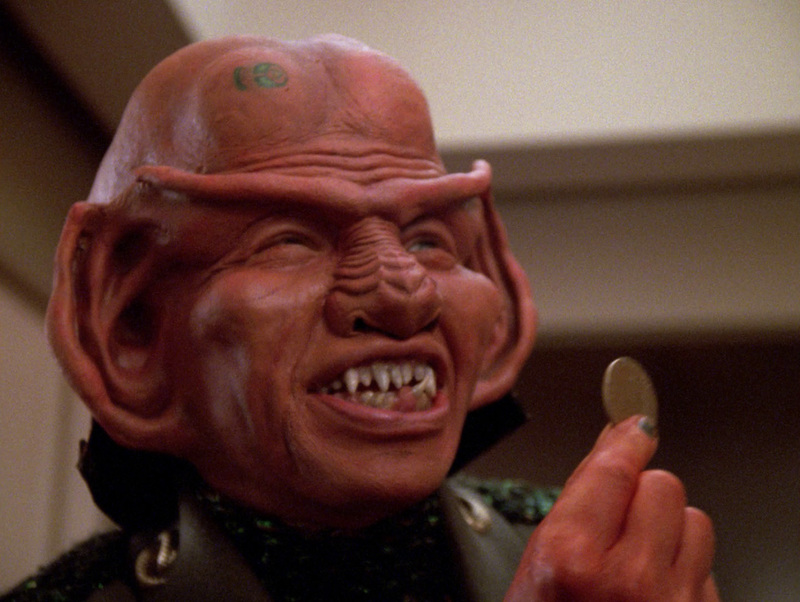 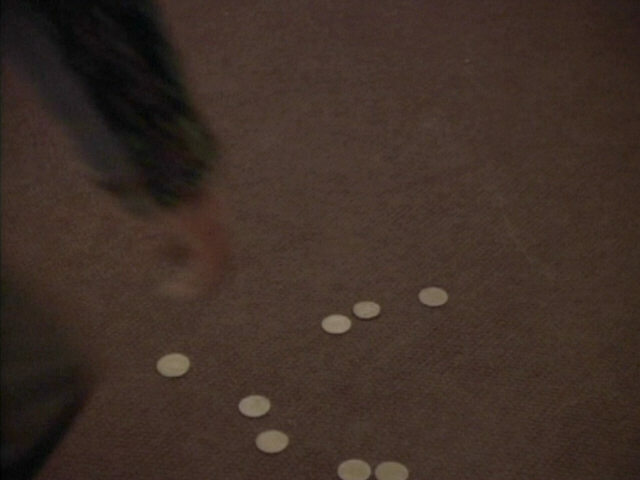 "The Nagus" The Ferengi and the coins in HD. 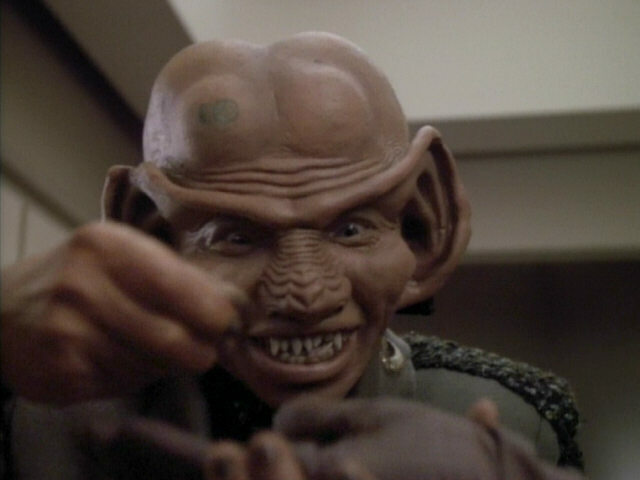 Par Lenor is the second Ferengi played by Max Grodenchik. 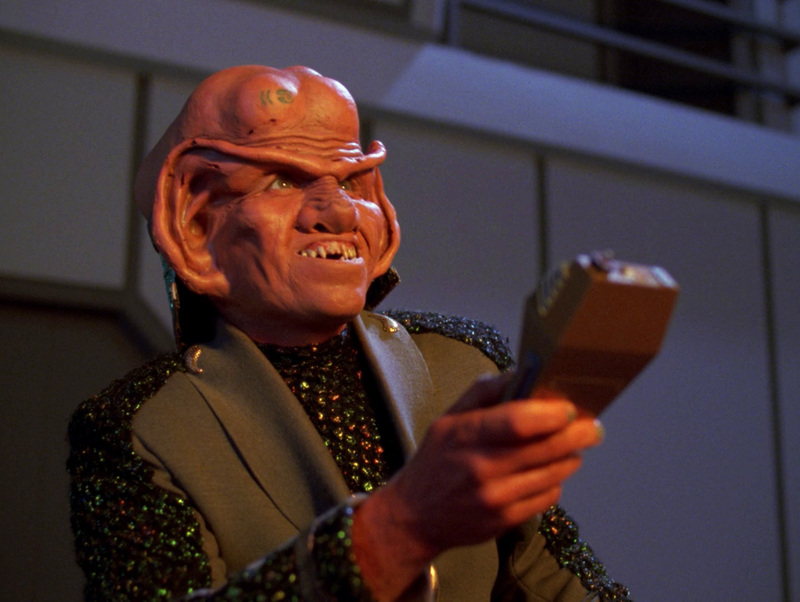 While he earlier played the Ferengi Soval in "Captain's Holiday", he is most famous as Quark's brother Rom, who appeared in all seven seasons of DS9. 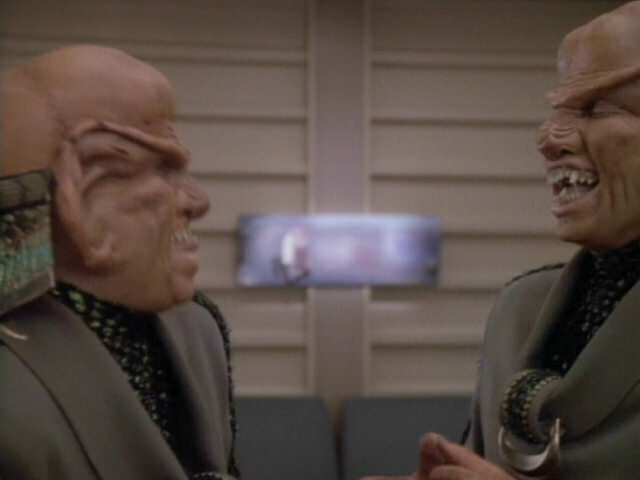 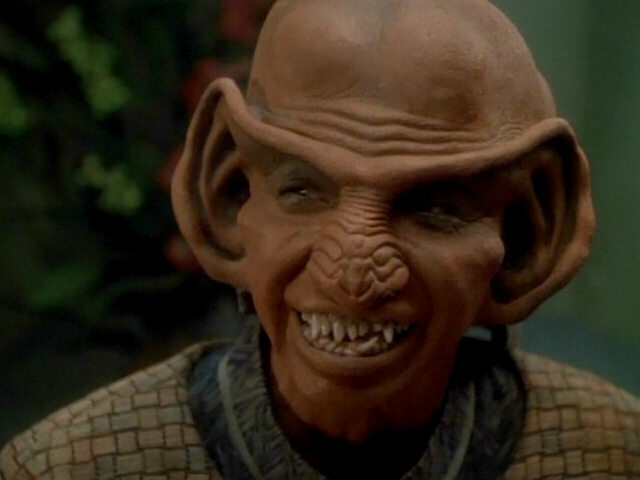 Even though the Ferengi head pieces and noses used for the three Ferengi characters are different in each appearance, all three Ferengi seem to have the same crooked teeth. 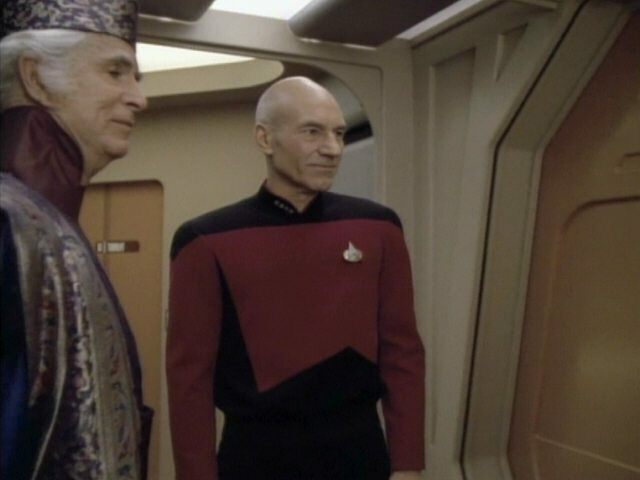 Just like ancient Earth cultures, Kriosians legends also seem to feature mythological creatures like harpies, like the one seen behind Picard and Kamala here. 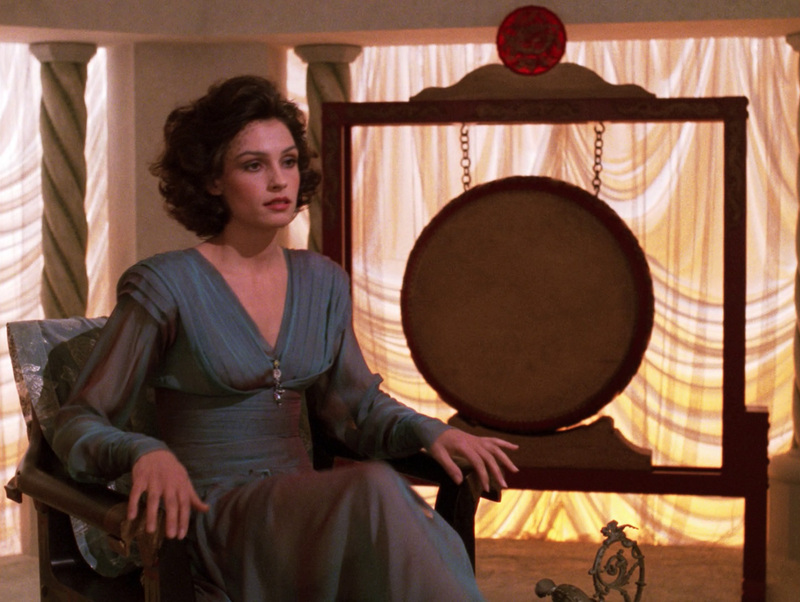 A better look at the set decoration in HD. 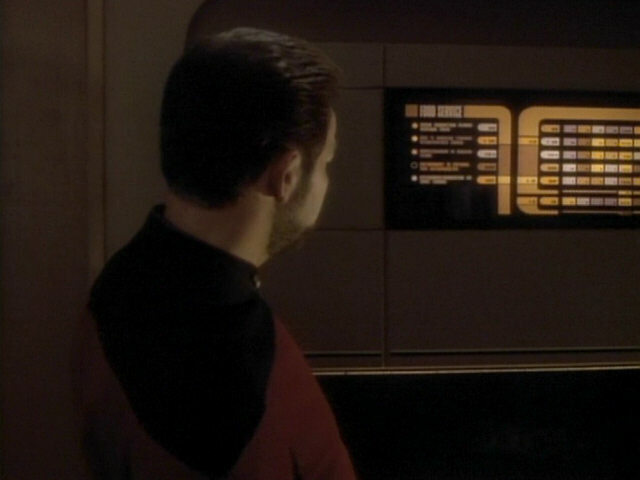 The Kriosian scrolls appear to contain text and pictures. 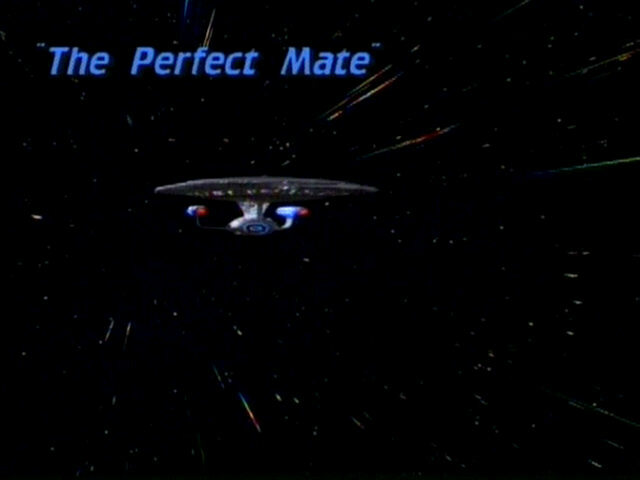 The text can be seen a little better in the HD version of the episode. 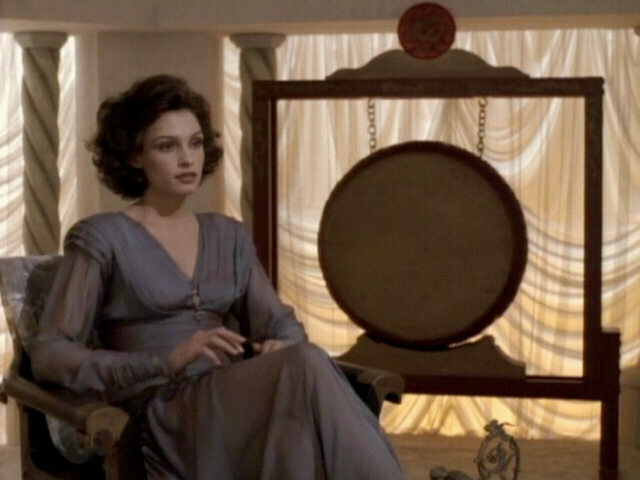 Very similar gongs like the one seen here were also found on the Ligonian Centerplace in "Code of Honor". 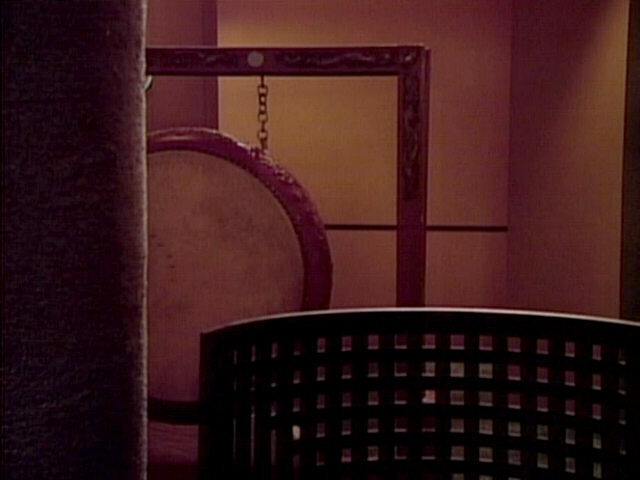 "Code of Honor" The gong in HD. 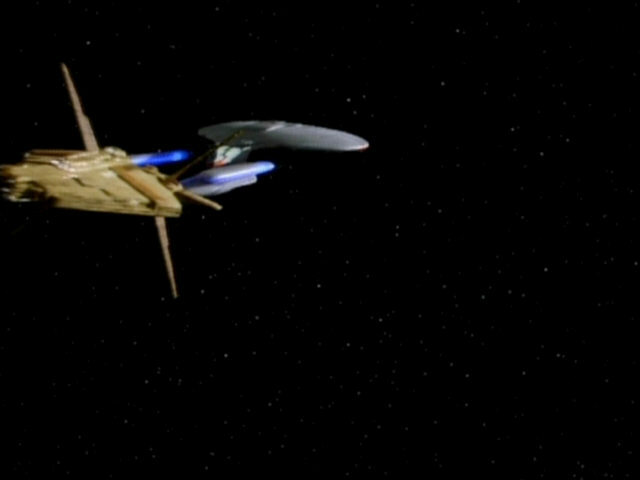 The Valtese ship only appears in this one shot. 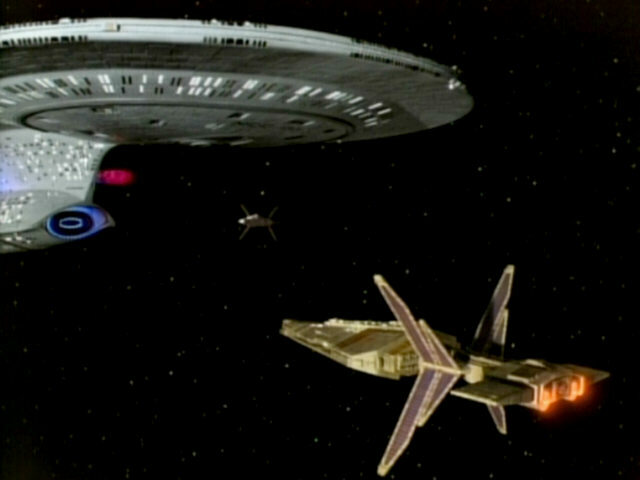 The footage is re-used from "The Most Toys" where the ship was supposed to be the Zibalian ship Jovis. 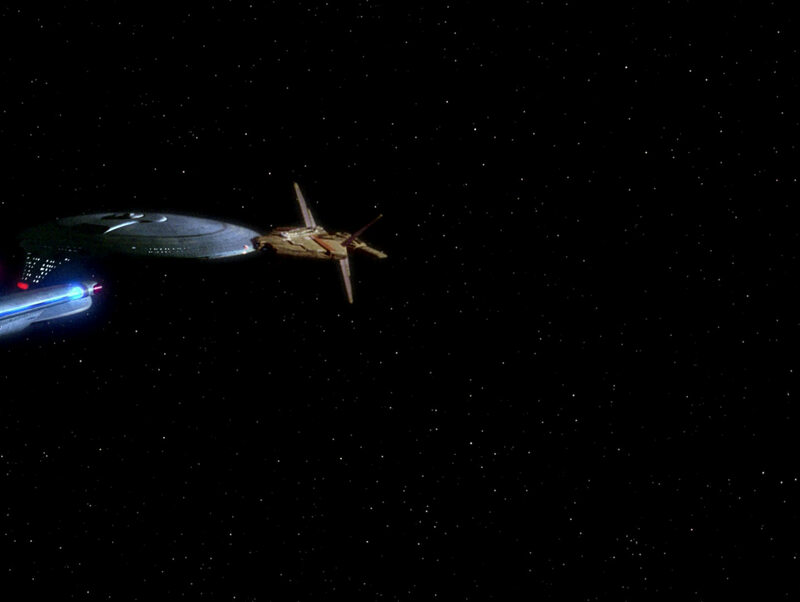 "The Most Toys" The unchanged ship in HD. 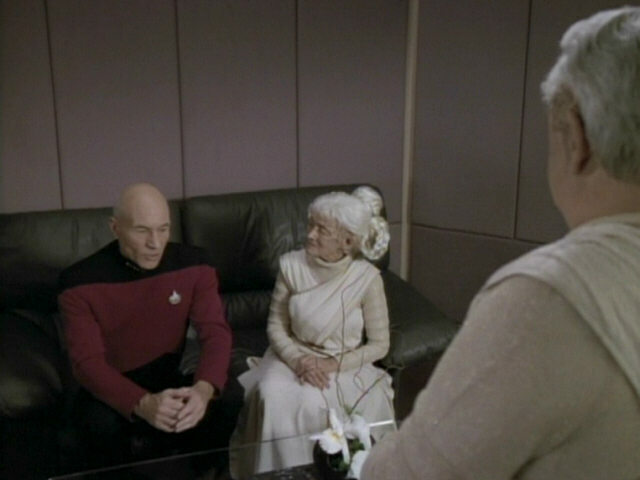 When this section of the junior officers' quarters first appeared in "Violations", it also featured a large couch. 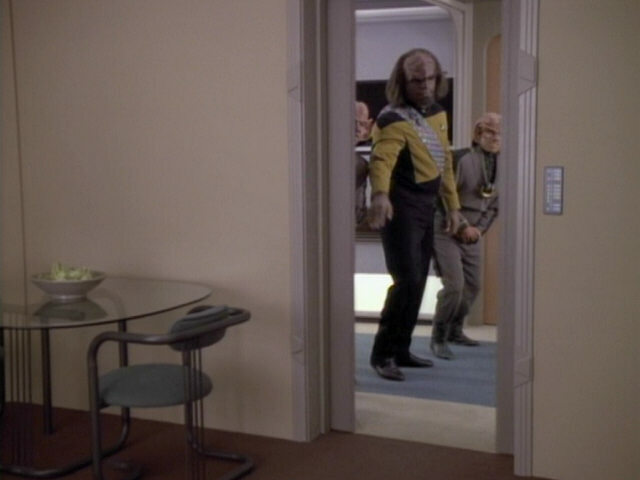 In "Ethics", this was where Worf's large biobed was located. 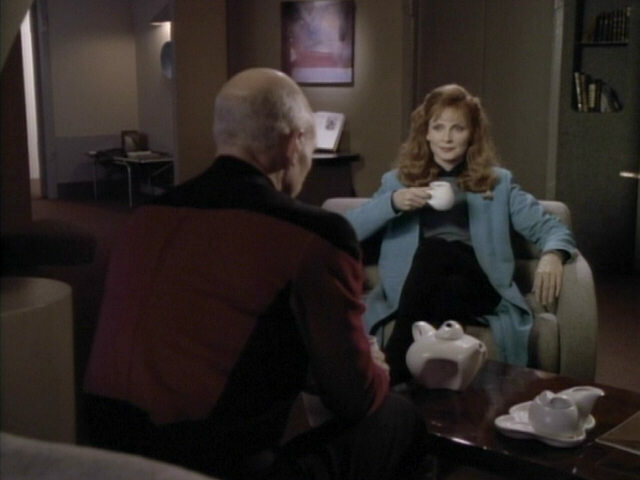 The characteristic tea set seen here, which often appeared in Picard's quarters in the final two seasons of TNG, makes its debut in this scene. 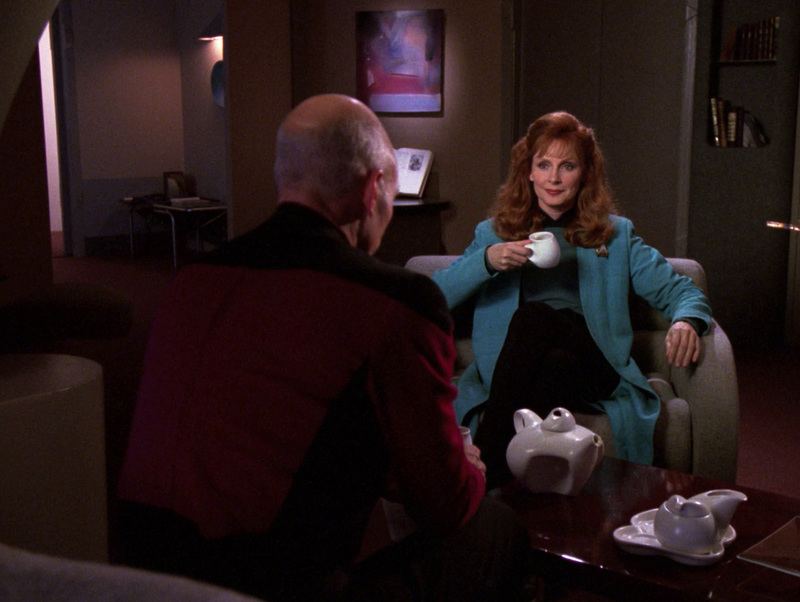 Strike" A better look at the tea set in HD. A very peculiar blooper happens at the end of the episode. 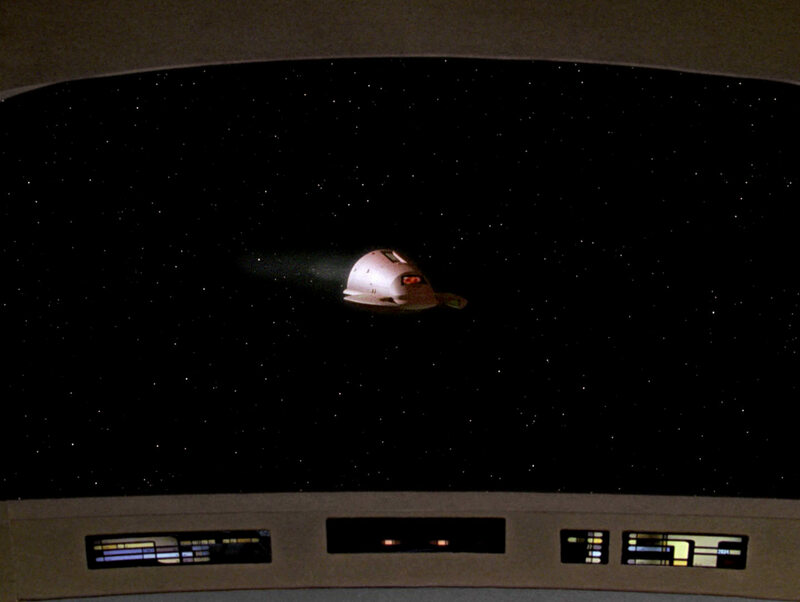 In the first shot in which the Kriosian ship is seen (before Picard and Briam enter the transporter room), stock footage of the USS Enterprise-D and the small Talarian observation craft from "Suddenly Human" is used. When the two ships part ways at the very end of the episode, stock footage from "Suddenly Human" is again used, but this time, the much larger Talarian warship is seen instead. 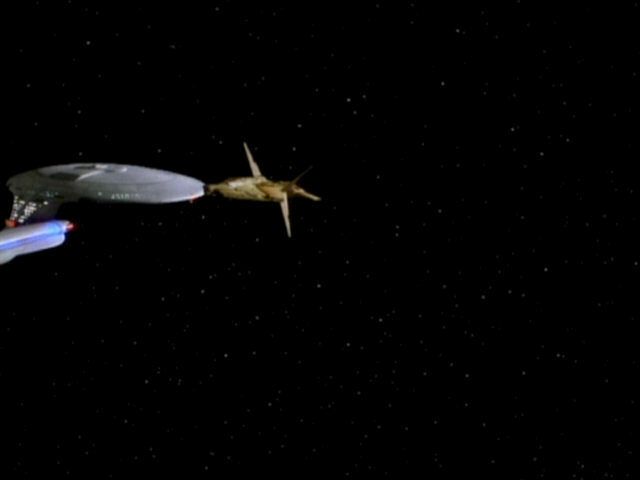 Human" Sadly this clear mistake was not fixed for the remastered version of the episode, even though the first shot could have easily been replaced by another shot of the Talarian warship facing the USS Enterprise-D, as seen in the screenshot from "Suddenly Human".